Control all your online communication with TransBox. TransBox is a user-centric data management service. You can use TransBox to control all of your sharable data. For example control your E-mail, online chats, social networks, blogs, and much more. Does this type of service interest you? With so much data being shared daily, leaks and theft of private information are becoming increasingly frequent. With this new method of secure file sharing via e-mail, chats, social media services and cloud accounts, there’s no reason to leave your data unprotected. It’s a brand new world, where documents, texts and pictures are selected only by users approved by the owner of the data. What Are They Key Features? -Data Encryption. Providing Data Box (Encryption) function for private and business communication such as e-mail, chatting, social media, etc. -Data view permission. Only permitted users can get UnBox (Decryption) permission of the data. -Data tracking. Providing transferred data tracking function. (Data reader, time of data check, remote data destruction). -Remote destruction. Text, photos and documents can be destroyed, you can even destroy the data you sent. How Does It Work (Image)? Now it’s possible to send images and encrypted messages, which can easily be erased at any time after being sent – and all remotely. 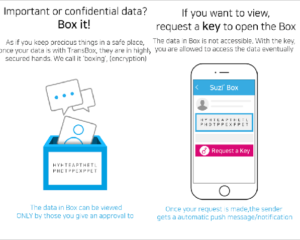 Transbox promises to protect users against any leak of their conversations and files. The app also helps companies that wish to keep their marketing, design and consulting. How Do I Know My Info Is Safe? Since data leaks seem to be so common lately anything to make data more secure is a good thing. The application has been designed by software developers. With TransBox everything is totally encrypted and synchronised. Check out their web site and download the app today. This idea is amazing! 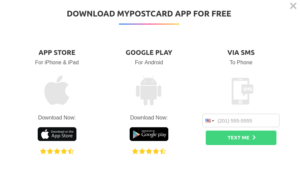 Turn your photos into real postcards with the MyPostcard App for iOS/Android. The idea comes from https://www.mypostcard.com/us/ and the process couldn’t be simpler. To create a postcard just go download the app, choose your photo or one from their design shop, write down your text, and send your card worldwide. To send a postcard the prices vary. For a worldwide postcard the cost starts at $2.29. 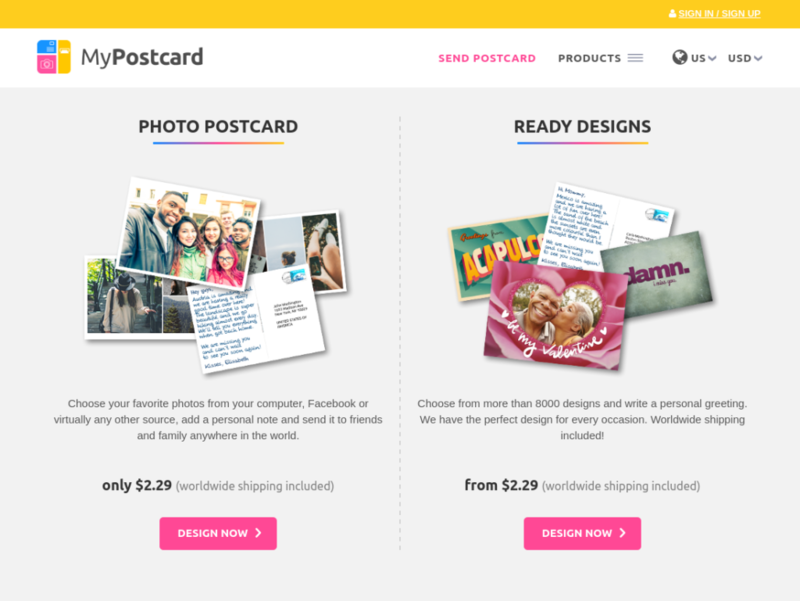 It doesn’t just stop at post cards, worldwide greeting cards start at $3.99. Check this out! You can either upload your own design or use one of theirs. As you can see both options start from $2.29 with worldwide shipping included. It’s a great deal. This is one of the cooler concepts I’ve seen. Send something more meaningful than e-mail check out MyPostCard today. 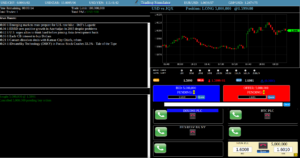 Today I wanted to let my readers know about a cool little trading desk simulator startup called http://simulator.astutefx.com/. It’s the first site I’ve seen that simulates what trading currencies for a large market maker is like. First go to site, next either register or sign in as a guest, and you will instantly be transported to the trading desk simulator. Best played on a laptop/mac/pc than a tablet. Once you get this thing going you’re getting phone calls, news is coming in, you can put in or cancel orders. It’s just like a real trading desk. “Sometimes when you are having a chat with the other half, some questions pop out which you struggle to answer correctly. This is a very interesting, niche simulator that I think will be very educational. 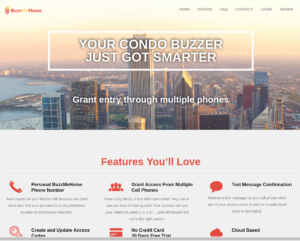 “Your condo buzzer just got smarter” is the BuzzMeHome tagline. BuzzMeHome is a new Vancouver BC Startup that automates entry into your Airbnb with access codes. The Buzz Me Home set up process couldn’t be simpler. Just sign up and you’ll automatically get a number, give that number to your property or building manager, set up your access codes and/or forwarding phone numbers, and enjoy. It’s that easy! Does It Work In My Area? Do I Need Any Costly Hardware? I have a feeling this product is going to take off very soon. Get in on the service early. Hopefully it can be of use to some CashSherpa readers on Airbnb. Once again the site is: https://www.buzzmehome.com/. Students can be assured that the study materials are prepared by professionals and are of high quality. I just visited the site and I’m seeing courses like “How to use After Effects composition File in Cinema 4D, Important Terms To Understand Mendel’s Work, Structure Of Mutual Funds In India, and Learn to Speak Mandarin (Traditional).” As you can see these are not basis courses, these are highly technical classes and 100% free. With more and more startups providing free or low cost education online I could see a future where self motivated, ambitious people around the world getting their education exclusively online. If I were a company hiring someone it would almost be more impressive if the job candidate learned coding, for example, online rather than at a traditional school. This would show just how self-disciplined and motivated the individual was. “What you have learned is a mere handful; What you haven’t learned is the size of the world” – Avvaiyar. The goal of Edupedia is ambitious and inspiring. It’s something I’ve sure most people around the world would want to support. If you would like to teach at Edupedia visit http://edupediaworld.com/welcome/aboutus if you would like to expand your knowledge on a wide variety of topics visit their home page. – Grow your e-mail list. See your new email subscribers in real time. Download all the names and emails of contestants in CSV. Coming soon. Aweber and Constant Contact integration. 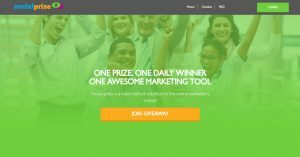 – Promote viral giveaways that generate leads. Gain Twitter followers and Youtube subscribers. This new startup is very useful for anyone looking to gain new subscribers. In the past I’ve run a giveaway and they are a lot of work. Letting a professional company like Social Prize manage your giveaways makes sense.